Credito is building a Credit Intelligence Network for the credit industry to prevent Credit Risk by identifying fraudulent transactions as they happen, allowing the industry to take well informed decisions. Although financial institutions are normally known as one of the most strictly regulated sectors, they are still a target for fraudsters. The consequences of fraud are not insignificant, resulting in financial distress for both banks and customers. While the financial institutions are active in the quest to identify fraud and reduce costs of fraud, they still lack a true global intelligence of all known frauds and compromises. 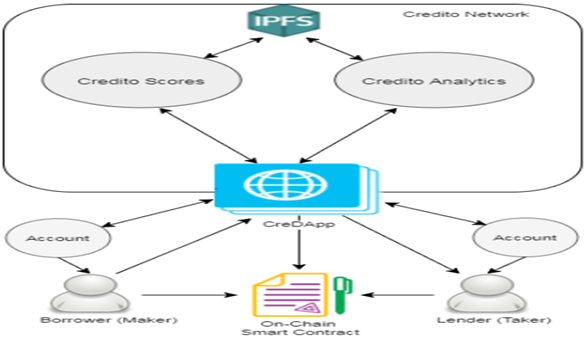 Credito is introducing a decentralized collateralized lending marketplace and enables connections between lenders and borrowers located anywhere in the world. This removes physical constraints and reduces the traditional lending costs and management fees, thus creating a better credit marketplace than anything available today. Decentralization provides more security and trust. It is a method to organise anything in a way that does not require trust on third parties. The trust is eliminated by executing code that does not require centralized governance, management, or servers. By decentralizing lending, we do not require banks or any other intermediaries for conducting a loan transaction. Decentralization through the use of Smart Contracts also removes any trust requirement between borrowers and lenders, providing a trustless and transparent lending environment unavailable in today’s market. What is the need for a decentralized and transparent Credit Intelligence platform? Despite the efforts of banks, issuers of cards and sellers, credit card fraud continues to grow faster than credit card charges. Data breaches have led to the fact that card data has been compromised, and the growth of online stores has led to greater opportunities for e-commerce fraud. According to Nilsson’s report1, 2016, credit card fraud losses totaled $ 21.8 billion in 2015, up 162% from 2010, which is $ 8 billion. Losses for 2016 have already been estimated at 24 billion dollars, and it is expected that by 2020 these losses will amount to 31 billion dollars. The Transparency Market Research study finds that “the global equilibrium level of the level market will be $ 8924 billion by 2024, from $ 26 billion in 2015. It is expected that the market will increase from 48% in the period from 2016 to 48%. and 2024.2. “Although p2p platforms continue to face the risk of default and fraudulent practices, growth prospects for this segment remain strong, especially at a time when the banking sector continues to struggle with permanent losses. Thus, a decentralized and transparent Credit Intelligence platform offers great opportunities for creditors, borrowers and financial institutions to reduce risk. Credito scores aim to derisk the investor’s investment and the borrowers’ credit score. 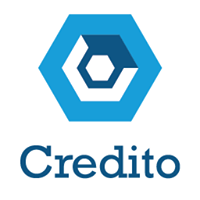 Credito scores are generated by Credito Analytic Engine, a self-learning algorithm using a continual feedback loop with the help of Big Data analytics , Machine learning, and Artificial Intelligence, offering a score which acts as a dynamic marker of a person’s probability to repay a loan amount, which evolves with the client’s record of loan repayment.